The world of vegetables is filled with color from bright yellows, reds and oranges to greens, purples and blues and color translates to nutrient dense; loaded with vitamins, minerals, enzymes and flavor. Unfortunately for the most part (there are a few exceptions), the vegetable’s role in our diets has been as the “side-kick” at a meal not the star and rarely has the vegetable been viewed as an important ingredient in a dessert. But in reality, they are the perfect “hidden dessert ingredient” with the power to deliver color, moisture and texture as well as an incredible array of nutrients. Carrots are the perfect example of this. They are naturally sweet and contain more sugar than any other veggie besides the sugar beet. Used during tough times when “luxury” sweeteners were too expensive and difficult to obtain, carrots provided both moisture and sweetness when needed and became the favored sugar substitute during the Middle Ages and World Wars I and II. Even to this day the carrot continues its starring role in the ever popular carrot cake…a true family favorite with zucchini, beat and parsnip bread as close cousins. 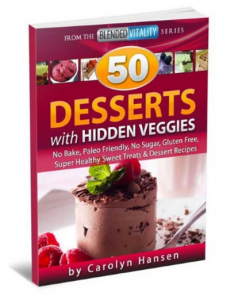 As more and more people become health conscious in this day of “instant-information,” they are searching for ways to get nutrient dense veggies into all their dishes…desserts included. No longer is the veggie limited to side-dishes. They are now being viewed as the perfect dessert ingredient adding sweetness, moistness and acting as the perfect binding agent replacing eggs and fat and let’s not forget all that added nutrition! Veggies are extremely versatile…they can play the “starring” role in a dessert dish as easily as they play the “starring” role as a side-dish. Or they can simply work their magic in desserts playing a more subtle role in the background. Either way, once you discover how to use veggies to make sweet desserts the guilt normally associated with indulging in desserts disappears! How’s that for the perfect reason to begin using veggies in your desserts? 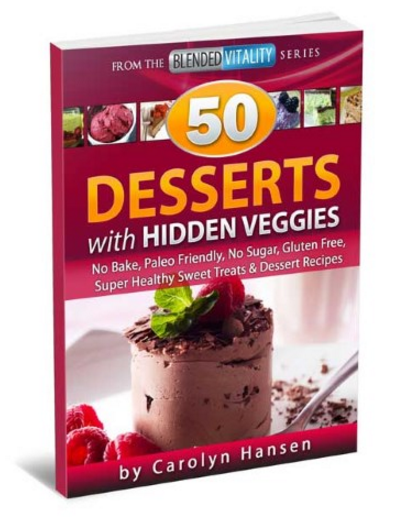 Without a doubt, veggie desserts become child favorites and are the perfect solution to getting more power-house veggies into their diets…without the ensuing battle cry of “I don’t like this!” No longer will you have to state: “if you don’t eat those vegetables on your plate…you don’t get dessert” when you build that extra nutrition into their desserts. That’s not to say that you should eliminate veggies as an important part of their dinner plate…it simply means that if your child does not care for a certain vegetable, you can likely use that same veggie in the background of your favorite desserts benefiting your children (an you of course) without your children even knowing.